Abode Ahangama is the latest project from the team behind Abode Bombay, Mumbai’s first socially responsible luxury boutique hotel. Designed for the style-conscious global traveller, our guests have come to expect beauty, generosity and attention to detail in everything we do. The UNESCO World Heritage Site of Galle Fort (just 30 minutes away) has always been a big draw for visitors to southern Sri Lanka but Ahangama is the region’s real hidden gem. With dozens of beaches just a short walk or tuk-tuk ride away, and hip new restaurants, bars and cafés popping up all around us, our newest Abode boutique hotel is located exactly where you’ll want to be. Abode Ahangama is fabulously unconventional in its style and individuality, yet suitably spoiling when it comes to making our guests feel right at home in our heavenly surroundings. Our four thoughtfully-styled rooms feature original artworks, reclaimed vintage furniture and the finest organic cotton bedlinen (woven by our local handloom partners in northern India). Complimentary breakfasts blend modern favourites with delicious local specialities and are served at our relaxed dining table. Sit back with a coffee and choose from a selection of tempting options – avo toast & egg, shakshuka, Sri Lankan hoppers and delicious smoothie bowls are all on the menu. Our private 18m swimming pool is deeply peaceful, shaded by jungle palms and fig trees. The Spa Room hosts the best local and visiting therapists – each personally chosen to provide a range of deep-tissue massages, Ayurvedic treatments and bespoke therapies to help guests relax into the slower pace of local life. And should you wish to create an all-round wellbeing experience during your stay, our network of experienced fitness professionals is also available. Guests also have access to the only outdoor gym in the area. 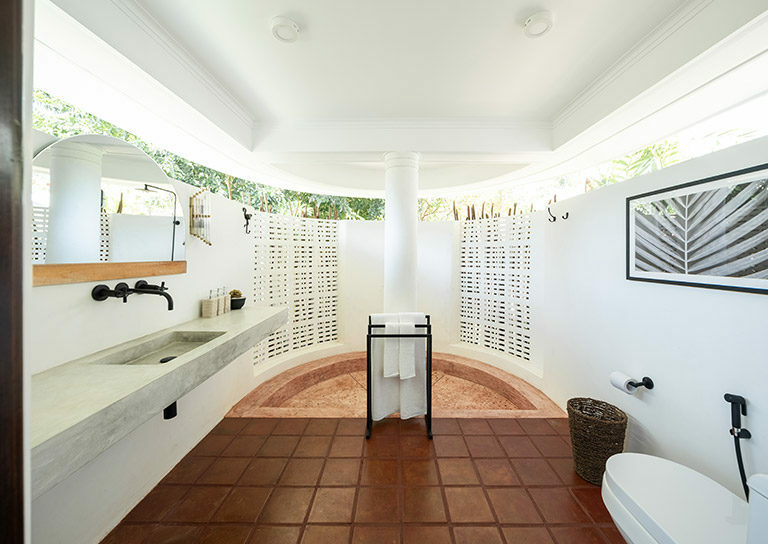 Abode Ahangama nestles in the tropical jungle just two minutes from the ocean and 30 minutes south of Galle in a lovingly restored art deco building styled in our signature boho-luxe blend of vintage, contemporary and upcycled interiors. Surrounded by lush foliage and an abundance of wildlife, it feels a million miles away from the chaotic coastal road, yet idyllic palm-fringed bays lie just a short walk away. Breakfast to the chatter of exotic birds while a peacock saunters by, a monitor lizard ambles through the garden and inquisitive monkeys peer out from the trees. Continuing the journey we started in Bombay, Abode Ahangama offers guests an experience that rivals other hotels by breaking the more traditional rules of management. Our team have no script: they are free to craft the most intimate, exciting and authentic Sri Lanka experience for every guest. And we very much look forward to welcoming you. We offer three Deluxe Rooms and one Superior Double Room each enabling guests to relax in complete comfort and privacy. All rooms feature newly restored vintage furniture, ensuite wet rooms with indoor/outdoor showers and artisan toiletries. Abode is a new breed of independent hotel, offering a refreshing contemporary approach to the modern global explorer who seeks an authentic, personal and genuinely engaging experience. In the heart of old Bombay, above the street hawkers and hustlers, Abode sits in an elegant colonial building whose period features have been lovingly restored and infused with the best of modern design. Raised in London and New York, and having travelled the globe, we have crafted a guest experience that rivals anything currently on offer in the city, whilst breaking all the rules of traditional hotel management. Our team members have no script; they’re free to craft the most genuine, exciting and bespoke Bombay experience for each guest. Our hotel was designed to blend into the landscape, by a Danish architect in the 1950s. We have maintained as much of the original architecture as possible in our restoration by retaining its 1950s layout – which allows optimum flow between each space – and renovating the antique windows, while also adding sympathetic lighting to illuminate original ceiling detail. The inherent natural beauty and character of the building has been reimagined, stripped back and reloved. Working with local artisans, we blended traditional carpentry and contemporary metalwork to breathe new life into the space. Our local team sourced reclaimed wood to create bespoke pieces found throughout the hotel, and we developed partnerships with brands that support local artisans and age-old crafts. We love Sri Lanka and passionately believe in making a positive impact wherever possible. Our environmental policy is now well-established and we constantly seek new ways of advancing an affirmative culture of constructive social influence. We also support Animal SOS, which houses over 600 cats and dogs from the area, cares for sick and injured animals, and runs neutering schemes to help stabilise the stray population. Animal SOS is just 5km away and welcomes visitors (www.animalsos-sl.com). To arrange a trip or share ideas about other social and environmental impact initiatives, please email us at gm.ahangama@abodeboutiquehotels.com.